The exact number of Palestinians in exile is unknown, with wide-ranging and contentious estimates by Palestinian and Israeli sources. 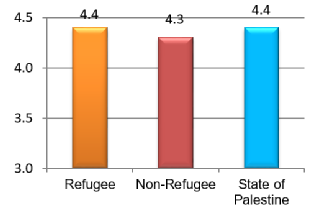 Reasons for the difficulty in obtaining authoritative statistics on the Palestinian refugee population include frequent migration, the absence of a reliable census or a formal registration system, and the lack of an official definition of who constitutes a Palestinian refugee. Although UNRWA has adopted an operational definition of a Palestinian refugee, this simply establishes criteria for assistance and excludes large segments of the Palestinian refugee population. Therefore, even within the Operation Areas, the actual number of Palestinian refugees is unknown and could be much higher than the number of registered refugees. On the other hand, UNRWA’s statistics have been criticized as being grossly exaggerated, due partly to the agency’s failure to consistently update its registration lists. DID ISRAEL CREATE THE ARAB REFUGEE PROBLEM? 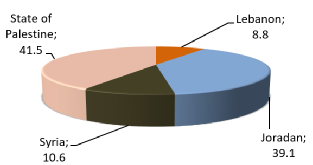 'Palestine Refugee’ became a ‘heritable status’ by UNWRA in 1965. The number of Palestinians worldwide is currently estimated at 12.37 million, with 4.75 million living in the Gaza Strip and the West Bank (1.85 million and 2.9 million respectively,) 1.47 million in Israel, 5.46 million in Arab countries and some 685,000 in non-Arab countries. 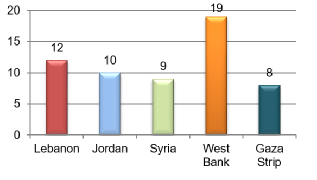 The Palestinian population within Israeli is particularly youthful, according to the report, with some 34.8% aged below the age of 15 years in 2014. 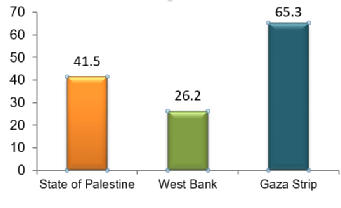 Only 4.2% of the Palestinian population in Israel is aged 65 years and over.